Scholars have highlighted varied causes of the DRC conflicts ranging from political exclusion, land wrangles, ethnic polarization to the struggle over the natural resources. The research sets to ascertain whether the Mineral resources are the major drivers of the conflicts and how durable peace can be reconstructed. Amidst all the atrocities committed, human rights violations, crimes against humanity and war crimes, the voices of the survivors are missing, yet their involvement in decision making is crucial. The study advances the field of Peace and Conflict Studies (PACS) where survivors’ stories, perspectives, experiences and images in conflict, and how they envision peace remain underexplored and integrated in academia. The research seeks to transcend the critique of the neoliberal top-down approaches and to advocate for a bottom-up model to augment and complement existing approaches to war and peacebuilding. Like other African nations, Congo depends on international intervention and ideologies to end a conflict instead of developing endogenic policies, theories and practices necessary for sustainable solutions. No nation, peace, security and development efforts can exist devoid of the local cultures and knowledge. The study engages leaders who are working for peace at various levels of society and civilian survivors who are victimized by the war since 1996. The research uses the qualitative research theoretical framework of critical ethnography and African indigenous qualitative research methodologies and the methods of semi-structured/open ended interviews. One of the reasons why peacebuilding processes in Congo fail is because they have not integrated the indigenous approaches (Autesserre, 2010). Indigenous methodologies combine “existing methodological approaches and indigenous practices” Smith (1999, p. 143). The interviews will be conducted for collecting the data. Some methodologists claim that African Indigenous Knowledge (AIK) perspective , ‘we live in an interview society’ (Fontana & Frey, 2000; Fontana & Prokos, 2007; Gubrium & Holstein, 2003). The interview approach used in the study differs from the Western approach in the sense that African Indigenous Knowledge (AIK) perspective is dialogic, conversational, relational, aims at healing and empowering people to undertake their own research (Dei, 2013). In Africa, a story can include proverbs, myths, folklore, music, and art or a photo. The metaphorical language usage in Africa’s oral traditions is always pregnant with meaning. The assistance of the IPRA in the successful completion of this project enhance PACS theories and praxis on conflict analysis, conflict resolution, prevention and peacebuilding. I trust that the restoration of peace in the Congo will contribute to stabilizing the GLR Region of Africa. Mayanja N.B. 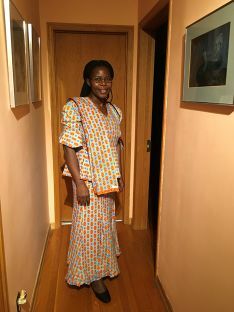 Evelyn is a researcher and educator in Africa’s Great lakes Region. Her recent projects include a study of the transitional justice process in Burundi, the Africanization of research, peacekeeping in Africa, peace leadership and the role of women in the reconstruction of the African state. Mayanja holds an MA in Applied Linguistics from Griffith University and a Bachelor of Science in Education from St. Mary’s University of Minnesota. Autesserre, S. v. (2010). The trouble with the Congo : Local violence and the failure of international peacebuilding Cambridge ; New York: Cambridge University Press. Dei, G. J. S. (2013). Critical perspectives on indigenous research. Socialist Studies, 9(1), 27-38. Fontana, A., & Frey, J. H. (2000). The interview: from structured questions to negotiated text In N. K. Denzin & Y. S. Lincoln (Eds. ), Handbook of qualitative research (2nd ed., pp. 645-672). Thousand Oaks, Calif.: Sage Publications. Fontana, A., & Prokos, A. H. (2007). The interview : from formal to postmodern. Walnut Creek, Calif.: Left Coast Press. Gubrium, J. F., & Holstein, J. A. (2003). Postmodern interviewing. Thousand Oaks: Sage Publications. Smith, L. T. (1999). Decolonizing methodologies : research and indigenous peoples. London ; New York Dunedin N.Z. : Zed Books ; University of Otago Press.